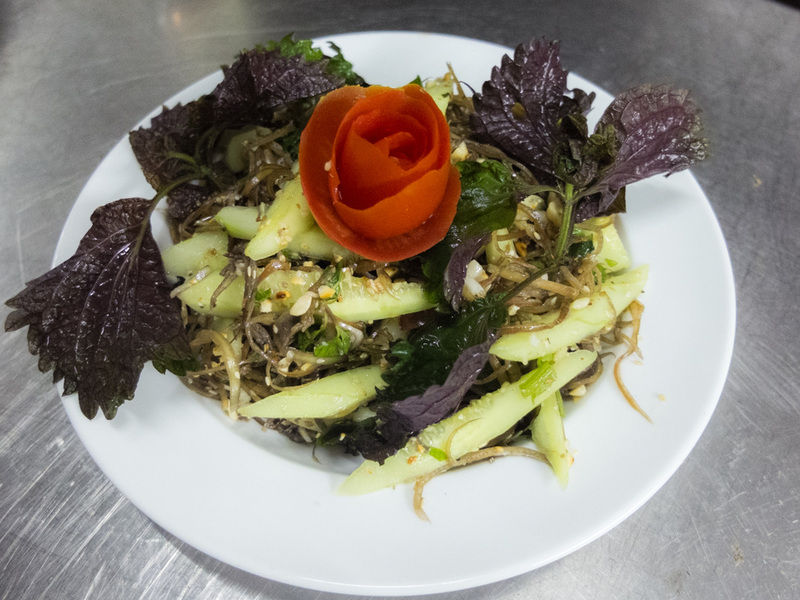 Nộm Hoa Chuối is a popular Vietnamese salad whose main ingredient is banana blossom, also called banana heart. Widespread throughout Vietnam, this truly tasty dish with rustic, rural roots varies slightly depending on the region. In Northern Vietnam, for instance, dressing is made with rice vinegar, as opposed to the south where they prefer to use lime to get that sour note. Banana blossom, shaped like a corncob with its intense reddish purple color, can normally be purchased in Asian grocery stores. However, in case you cannot find it, it can be replaced by green papaya, white cabbage or kale even. Similarly to artichokes, remove the hard, external leaves of the banana flower, then finely slice the remaining flower. The finer you cut, the better the end result. Put the finely sliced banana blossom to soak in water with a teaspoon of salt and a bit of rice vinegar for 15-20 minutes (this will help to soften it and make it white). Cut the cucumber and carrot into thin strips (i.e., julienne style) and slice the fresh chili. Coarsely chop the mint (best if you have 2 or 3 different types of mint). Then prepare the salad dressing by mixing in a bowl a drizzle of oil, rice vinegar, fish sauce, chopped garlic, sugar and chili. Toast coarsely chopped peanuts and sesame seeds in a pan. Drain the sliced ​​banana flower and tap dry with some paper and place in a bowl. Add cucumber, carrot and a bunch of coarsely chopped mint. Add dressing to the salad and sprinkle with peanuts and toasted sesame seeds. Mix and toss well and leave to stand for 10 minutes before serving.